Why Danao Adventure Park is special ? 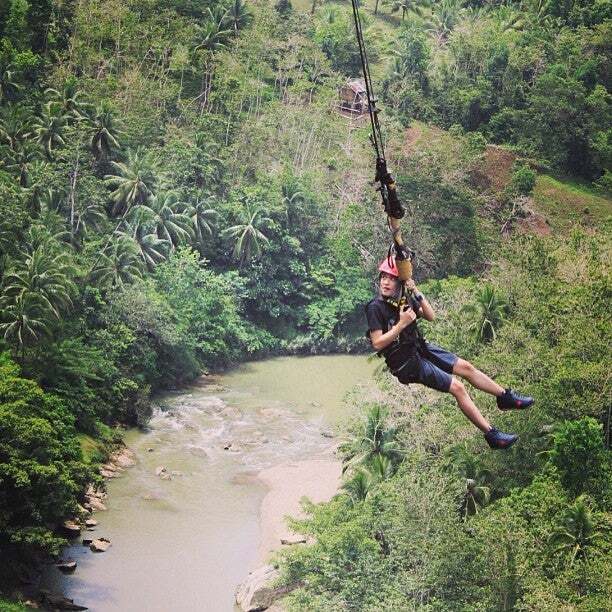 Danao Adventure Park is nestled in the mountainous range of Bohol. E.A.T. Danao is the town’s newest brainchild. “E.A.T.” does not only pertain to the partaking of the town’s organically grown and fresh food which is in abundance but also a whole new experience far superior to the common offer of Chocolate Hills’ tour, tarsier and dolphin/whale watching. What to explore at Danao Adventure Park? How to get to Danao Adventure Park? Take a Jeep. It costs Php 7-8/trip. Look for a jeep that has the sign "ICM"/"Island City Mall" or "Dao Terminal"
Board the bus from Tagbilaran heading to Danao. After exiting the bus at the Danao terminal, take a habal-habal to the adventure park. One-way it costs Php40/person and each motorcycle needs to take at least 2 passengers. There are three must-dos before you can claim to have truly experienced the park: The Sky Ride, The Plunge, and the Suislide. As you will wear a helmet do not forget to bring the headstrap for the GoPro for a safe fixing. The staff is also very helpful and can take pictures / video with your cam. They also serve Lunch Buffet @ Php300/person by booking , minimum of 30 Pax/group. Daily Serving on ALA CARTE basis. Their photographers catch every second of your descent and prints copies of pictures of your choice. Soft copy of your photos maybe requested if you bring along a flash drive and you pay a certain amount which isn't pricey. Before you leave Danao, pay your respects at the Dagohoy Marker. This memorial statue is a tribute to Francisco Dagohoy, an indomitable Boholano who led the longest revolt in Philippine history. If you choose to stay a night at the park, note that there’s nothing to do after 5pm and the adventures are closed. The whole place is dark. The only tv is in the resto. Besides the entrance fee, you have to pay the parking fee and extra charges for Recreational Equipments/Facilities and Activities. I've been here around 4 times for the Zipline. But the last time I was here was in December 2010 when I took the plunge. It was really quite an experience. At that time it cost P800 and like the tagline said, you pay for the experience of being dropped into a gorge with only a line to hold you to solid ground and a thin helmet to protect (?) your head. They ask you first if you want to fall head or feet first, and you are strapped accordingly. But guess what? Once you overcome the fear of the initial drop, you will say the price wasn't worth it - because you want to do at least another jump! If I didn't consider myself an adrenaline junkie, this experience really made me change my mind. This was also where I had my first zipline experience. Truly exhilarating, so the next time I went, I made sure to have a camera strapped to my hand to document the trip across the canyon. My brother went spelunking with his friends and liked the experience! The park has other adventure activities. Be sure to allot two days - one for the long trip back and forth Tagbilaran (or wherever you're staying) and one day for the activities.